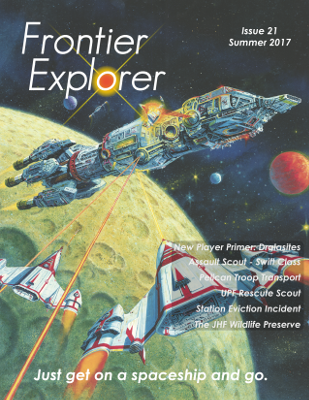 Welcome to issue 21 of the Frontier Explorer. This time around we have another spaceship themed issue and you might just recognize the cover image. As we are celebrating the Star Frontiers 35th Anniversary I thought I’d use the iconic Knight Hawks cover image for this issue. Grab your copy and remember to always keep exploring.